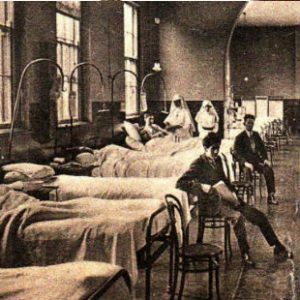 St Vincent’s Hospital, Dublin was the first Catholic hospital run by Religious women. In 1815, Mary Aikenhead, with Alicia Walsh, after completing their novitiate, founded the Religious Sisters of Charity in Ireland. They were the first, so-called Walking Nuns who visited the sick in their homes and tried to alleviate the wide spread poverty. In 1831, Mary suffered severely from inflammation of the spine and was prescribed complete rest but continued to administer the growing congregation from her sick bed. She also became a close friend of her physician, Dr O’Farrell, and while he attended her, they began to work on a hospital project. Mary had received a dowry of £3000 and with this she planned to open a hospital. Haunted by the misery of the wretched slum dwellers, she knew she wanted a large, airy building in a good locality with a fairly spacious garden. In 1833, she sent three Sisters to the Hospitalières de St Thomas in Paris to learn about hospital administration. 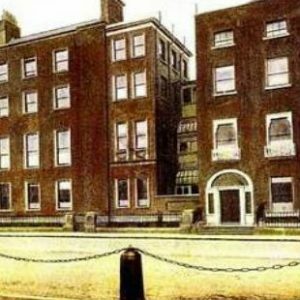 The following year, with unshakeable belief in Divine Providence, she bought the Earl of Meath’s mansion on St Stephen’s Green, Dublin, and with her health much improved, she supervised the conversion of the building to a hospital. Funds began to trickle in. In 1835, the first ward of St Vincent’s Hospital was opened. the Sisters resident at St Vincent’s heard a noise. Mother Mary Aikenhead’s dependence on Divine Providence – “God will provide” – was the driving force in all that she achieved for God’s poor. Thisis the legacy the Sisters of Charity of Australia hold dear. The legacy of Mary Aikenhead’s revolutionary idea is still operating to this day. Now administered in Australia by Mary Aikenhead Ministries, St Vincent’s Health Australia, together with its partners, forms one of Australia’s leading Catholic, not-for-profit, diversified healthcare providers. Founded on a firm commitment to Gospel values and Catholic social teaching and conducted in the spirit of Mary Aikenhead, the health services span the public, private, and aged care health sectors. Health services include: Tertiary referral centres; adult acute health services; sub-acute care diagnostic services including pathology and radiology services; public and private rehabilitation; extensive allied health services; inpatient and community mental health; public and private emergency centres; inpatient – and community-based palliative care; correctional health; community health; a full range of aged care services, including acute, residential, and community care;research institutes. The dream which impelled Mother Mary Aikenhead to found a hospital in Dublin for the sick poor spread around the world. There are 14 hospitals in Australia alone which were founded or acquired by the Sisters of Charity of Australia which are now administered by Mary Aikenhead Ministries. But the vision in Ireland came to a close at the end of May, 2017 when the Congregational Leader, Sr Mary Christian issued a statement which said the the Religious Sisters of Charity would end their involvement with St Vincent’s Healthcare Group, and would not be involved with the ownership or management of the new National Maternity Hospital. “For the last two years we have been actively working to find the best way to relinquish our shareholding in the St Vincent’s healthcare Group (SVHG). It includes three hospitals; St Vincent’s University Hospital, St Vincent’s Private Hospital, and St Michael’s Hospital, Dun Laoghaire,” she said. Reaction to the news was both swift and somber. 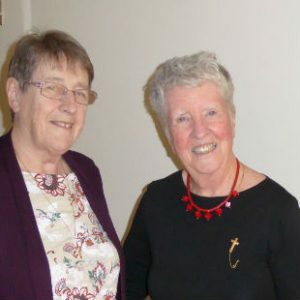 The Congregational Leader of the Sisters of Charity of Australia, Sr Clare Nolan (with Sr Mary Christian, below left) wrote to the Congregation here on May 30: “Difficult news from Ireland overnight… after more than 200 years of service to the sick poor of Ireland, our founding Congregation has announced it will end its involvement with St Vincent’s Healthcare Group. The reaction continued in an interview in The Irish Times on June 3 with one of the Religious Sisters of Charity’s best-known members in Ireland, Sr Stanislaus Kennedy. The depiction of the Sisters of Charity during the recent controversy over the transfer of the National Maternity Hospital to St Vincent’s hospital was akin to elder abuse, according to Sr Stan. She said she was shocked and surprised by the scale of the controversy over St Vincent’s and the criticisms levelled at her order. “It shook me, it really did.” During the controversy, very little thought was given to the background of the Sisters of Charity and the work its members had done over the years, she contended. “In another context, this would come under elder abuse,” said the 78-year-old nun.